To support a tooth that has lost adequate natural tooth structure from trauma or decay. To hold together a tooth that has cracked. To restore the natural height of a tooth that has experienced tooth structure loss from a long period of grinding teeth. To attach to a dental implant. To improve esthetics of a malformed tooth that cannot be improved by less invasive or simpler cosmetic procedures. In order to prepare a tooth for a dental crown, some of the outer parts of the tooth (most of the enamel) has to be removed so that the crown can fit over the tooth and protect it. Once the tooth is prepared, a 3D scan or dental impression will be taken of the tooth in order to fabricate a custom-made dental crown for the patient. 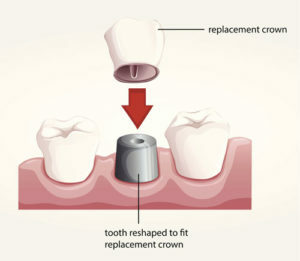 The crown is then attached to the tooth using dental cement. Did you know that there are actually many different types of dental crowns? Even more so today, with recent technological advancements, there have been major improvements in durability and strength of materials such as porcelain and zirconium. These materials offer highly esthetic, tooth-colored options for patients who do not want to show “metal” in their smile. It is important to note that not every tooth is best served with a porcelain or zirconium crown—there are a number of situations in which a gold crown or a PFM (porcelain fused to metal) crown may provide better longevity for a tooth in the back of the mouth. This is because each type of crown has different material properties and these should all be taken into consideration when choosing the right crown for you. If you need a crown, Dr. Street will be able to answer any questions you might have about the crown preparation process and the different materials that are used for each type of dental crown.